Azerbaijan State Chamber orchestra (former name - Chamber orchestra of Azerbaijan radio and television) was established in 1964 with Gara Garayev and Fikret Amirov's initiation. Its first art director and band-master was People artist of Azerbaijan Professor Nazim Rzaev. Gara Garayev's name was given to the orchestra in 1982. 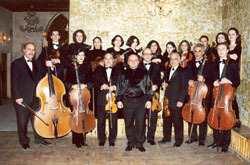 In 1990-1994 orchestra was lead by People artist of the Azerbaijan Republic Ramiz Malikaslanov. In 1994-1997 Honored artist of Abkhazia Yashar Imanov took this position. Since 1998 Honored artist of the Azerbaijan Republic Teymur Goychayev has been a director of the orchestra.